Montessori education is an educational approach developed by Italian physician and educator Maria Montessori and characterized by an emphasis on independence, freedom within limits, and respect for a child’s natural psychological, physical, and social development. Montessori system of education is both a philosophy of child development and a rationale for guiding such growth. Dr. Montessori’s Method has been time-tested, with over 100 years of success in diverse cultures throughout the world. Most people understand the Montessori Approach to be one that applies only to the 3-6 age group. 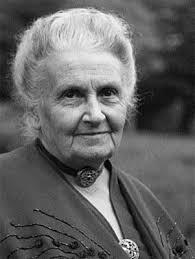 While Montessori schools operating the 3-6 age group are certainly the most common, Dr. Montessori’s work had spanned the entire period of human development from birth to the age of twenty-four. These are split into the developmental planes of 0-6, 6-12, 12-18 and 18-24. The central principle in the Montessori Approach is that of using education as an aid to life. And the effectiveness of the approach comes from the fact that the principles of the Montessori Approach go hand in hand with the child’s own natural development stages. Montessori classrooms are referred to as prepared environments which provide children an atmosphere where they can choose the work they wish to pursue and allow them the freedom to develop at their own pace. In this work, the children are guided by a trained adult. The classrooms also contain specially designed materials which help them in their path of exploration and in developing specific skills, be they in language, mathematics, sensorial development or in activities of practical life. By having mixed age groups in classrooms, the children also have access to a holistic social environment where they can all grow and develop at their own pace. The concepts that have been touched on here like the prepared environment, the aspect of freedom and the mixed age groups are common across all four developmental planes, although the practice would vary widely to take into account the stage of development the child is in.